A Raleigh Balloon Twister is making a name for himself. Magic by David is a Raleigh North Carolina Balloon Twister. This Raleigh Balloon Twister has been performing for 10 years now. You can reach him at 919-266-1682 or davidmagic.net. Hire the Raleigh Balloon Twister and your party will be a hit. From aliens on top of heads, flowers on wrists, to snakes on your back. The Raleigh NC Balloon Twister knows hundreds of designs. All parties need balloons – so why not get the best? 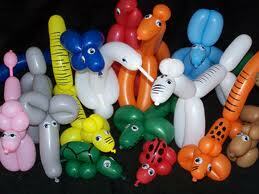 So if you need a Raleigh Balloon Twister hire Magic by David. He comes to your event with a huge pump and more than a 1,000 balloons. Prepared for everything this Raleigh Balloon Twisterknows what the children want – huge balloon sculptures. David will be performing balloon twisting for the Special Olympics in 2012. David loves to entertain. David is also a well known magician. He has live animals in his show. Including a real live monkey. Now with twisting balloons in his show – what a treat ! Call the Raleigh Balloon Twister at 919-266-1682 to book your event.